Showcasing Scafell Cottage, our largest cottage, which sleeps 9 to 11! 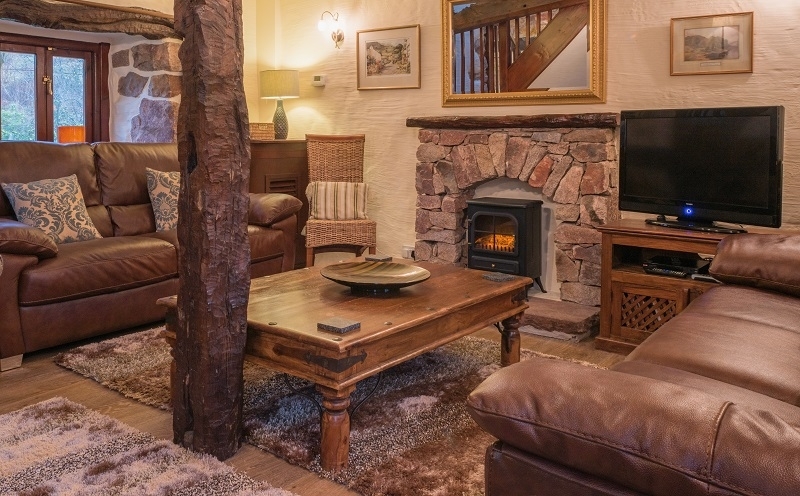 Scafell Cottage sleeps 9 to 11. Full beds for 9 plus a comfortable fold away Z bed for a 10th person and cot for an infant. It has the most beams and biggest stones of any of our cottages. You can step out the back door for breakfast, lunch or dinner with breath-taking views of the fells rising above Boot village. The new kitchen has side by side double fridges, there is a separate full size freezer discreetly tucked away in the cottage, plus a wine cooler next to the beautiful new hand made dining table. Our new Accessibility Friendly Features for those with Limited Mobility. We have discovered that we are possibly the only cottages in the Eskdale Valley to have ground floor facilities for less able visitors so if you, or your friends or family joining you struggle with stairs, then book Scafell or Wastwater Cottage. Both have double bedrooms downstairs and large shower rooms with wide doors and walk in showers. We have installed grip handles by the showers and toilets and done everything else required for the Visit England Level 1 Mobility criteria and we are just waiting for our annual inspection to confirm the Level 1 Mobility accreditation. Stanley Ghyll Cottage also has everything that a couple are likely to need without going up stairs. The kitchen, dining room, bedroom and bathroom with walk in shower are all downstairs. So, if you or someone in your group has limited mobility then let us know and book one of our cottages with everything on the ground floor. If you need a wheelchair ramp, we have one. Just let us know what you need when booking. What's on in Boot? The Boot Beer Festival! It all started during the dark times of Foot and Mouth Disease; people could not walk the fells, but they could drink the beer! Many years later it is the busiest weekend of the year in Boot and now widely regarded as one of the best beer festivals in the Lake District. Come and sample the fabulous food and fine Cumbrian Ales this June at the The Boot Beer Festival. We still have just a couple of cottages available for the weekend or part of the weekend. If you can't squeeze in the time this June, then put this on your radar for next year. The annual festival offers the largest selection of beers in Cumbria, with over 150 to choose from, most from local breweries and all offered by just three pubs! The weekend is a family friendly and fun event, with soft drinks, ciders and homemade pub meals to suit all. Come and hike the hills before tasting the beers or simply walk between the three pubs!